Request scans of book chapters and articles to be emailed to you. Disability Information and Support can also offer assistance if you are registered with them. Items for Home Delivery go by courier to the home address you have entered into eVision: Make sure it's correct before placing requests. Read: How to request items for Home Delivery, chapter and article scans (opens in a new window). Watch: the videos (click on the images below to see how to request books, journals and scans). We send books to you by courier, and you can return them the same way. Use the return address label provided in the parcel your books arrived in. This is for the free courier service. You can also re-use the packaging. Place the return label on the front of the parcel. a) Phone the New Zealand Couriers Customer Service team: 0800 800 841.
b) Let the team member know that you have an item to be picked up. c) Provide your name, address, contact number and where the item will be left to be collected by the courier. d) The customer service team member will then arrange for this item to be collected. b) Click on the “Find us Quick” tab to locate your nearest New Zealand Couriers branch. c) Drop your item off to this branch. 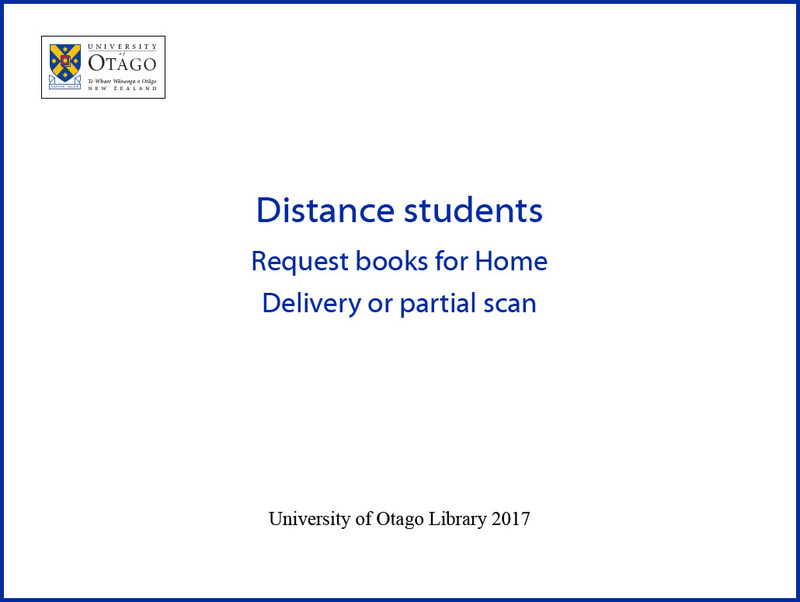 Drop books off at any University of Otago library in Dunedin, Christchurch, Wellington or Invercargill. If you don’t have the return address label, you can return books using the Freepost address. You’ll need to take your parcel to a Post shop. Include the Freepost number and you won’t need to pay the postage. If you have questions about your books (renewals, requests, fines etc.) please contact the Library or ‘reply’ to your email notices. 0800 347 826 or 0800 DISTANT (NZ only) (24 hour answer phone). Pay library fines - including credit card payment option to clear fines immediately. Check out the range of Subject Guides for answers to your library questions. 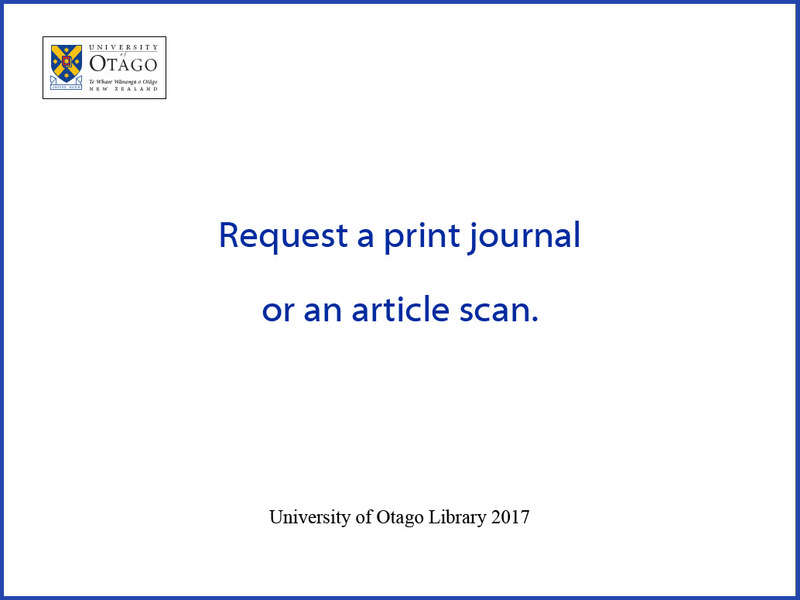 Access Databases or Google Scholar from the Library Homepage for fulltext access to Otago resources. REMEMBER RECALLS! All books may be requested by another borrower, at any time, and an earlier due date assigned. We'll email you with the new due date. Usually you will get seven days to return a recalled book - if they become overdue the fine is $3.00 per day. If you live in one of the main centres around New Zealand you may use the local University Library to borrow books. 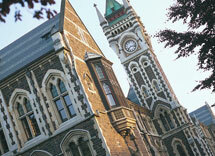 You will need proof of your enrolment at the University of Otago, and address details to join.